*clears throat* I have a confession. I am obsessed with lists. Okay, if you know me at all, that’s not a confession. But if you don’t know me or only sort of know me, you may not know the extent I’m obsessed. At work, I’m an office manager. I keep sales lists, lists of vacation time, lists of phone calls made or emails sent, lists of audits of customers, lists of new sales, lists of things I need to remind my boss to get done, lists of follow ups with customers, and more. This serves me well at my job because things (rarely) get forgotten this way. The first list that has to go is the master list. The ‘You Should Be Able To Do It All’ List. The ‘I Know This Will Cost $50,000 To Complete Everything And You Don’t Have $100 Right Now But Don’t Forget It Needs Doing’ List. The ‘You Are A Failure At Managing Your Time, Look At All That You ‘Have’ To Do’ List. You get the idea. 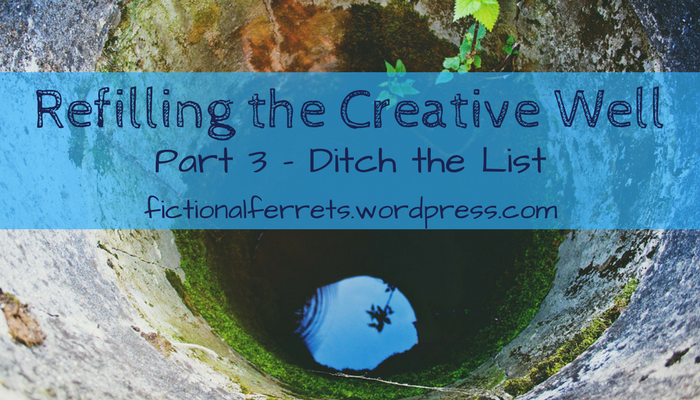 While a couple of these lists I keep tucked away out of sight because I do need to keep track of bigger projects, most of these only end up making me feel overwhelmed and beat-down with time. Why am I NOT Superwoman? These lists only make me berate myself with that question and so if I’m hitting overwhelmed… they’ve got to go. I like fiddling with scrapbooking, photo books, and other assorted projects too. These projects are usually rather time consuming but always worth the end product in my eyes and I really do enjoying working on them. They are a lovely break when I want to be creative but don’t want to write. But when ‘Overwhelmed’ and ‘Burned Out’ sets in… these need to be shelved. In fact, this year I entirely gave up my ‘Good Things’ project I have been at for the last few years where I write down various little good things throughout the year as they occur and then go through them on New Year’s Eve (and eventually scrapbook them as well). That doesn’t mean I don’t think 2018 is going to be a good year. I’m determined to make it awesome! But this little project is One More Thing to do and lately I’ve needed to clear those off the table. I’m still making occasional notes of things, but without any pressure to do so for the year or to do anything with them later. Maybe I’ll be up to it again in 2019. You knew I’d get to this too, right? This does NOT mean that I quit writing. It means I don’t beat myself up for not doing so. It means I stop tracking daily, weekly, or monthly writing habits. It means if I don’t feel like submitting my work, I don’t. It means I don’t tell myself I HAVE to do it. It means I give my brain permission to rattle away quietly in the background without feeling pressured to produce anything particular. It also means I encourage my imagination to let me record things when they come to mind or grab me in a particular way, but do my best not to pressure it into making anything of it. If I try to force creativity right now I’ll end up hating the process and the result both. It just isn’t worth it. In the end, to refill my own creative well I have to ditch the have-to’s and give myself a break. It’s hard for me to do that, but when I do I start to clear the way for creativity, inspiration, and productivity to seep back in.